A symbiotic relationship in which one organism benefits while the other is neither harmed nor benefited. 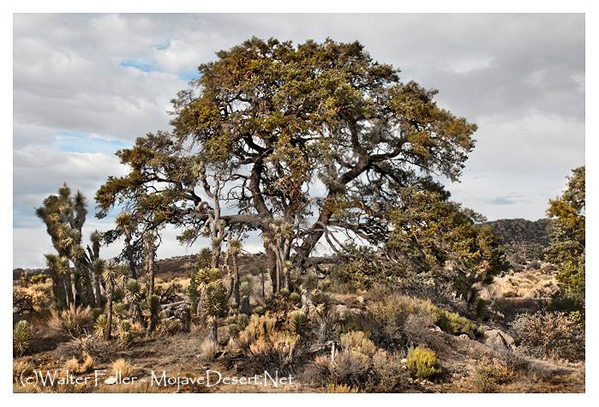 Mature pinon pine tree provides shade for young Joshua trees. Moss growing on trees benefits by being raised above forest floor competition, while the tree doesn't get much out of the deal either way. A desert holly shrub provides shade for young creosote bush. A cactus wren builds its nest in a cholla cactus to protect its young from predators such as raven. There is no harm to the cactus. 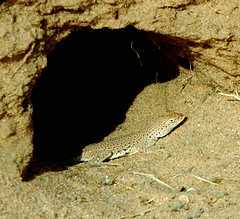 A Mojave fringe-toed lizard living in an abandoned rat hole, the lizard benefits from shelter, while the rat has moved on.